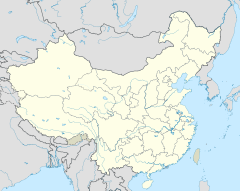 For ither uises, see Chang'an (disambiguation). This airticle is aboot the historic ceety. For the modren day ceety, see Xi'an. Chang'an is in north central Cheenae. Chang'an listen (help·info) (simplifeed Cheenese: 长安; traditeeonal Cheenese: 長安; pinyin: Cháng'ān; Wade–Giles: Ch'ang-an) is a auncient caipital o mair than ten dynasties in Cheenese history, the day kent as Xi'an. Chang'an leeterally means "Perpetual Peace" in Clessical Cheenese. Durin the short-livit Xin Dynasty, the ceety wis renamit "Constant Peace" (Cheenese: 常安; pinyin: Cháng'ān); yet efter its faw in AD 23, the auld name wis restored. Bi the time o the Ming Dynasty, the name wis again chyngit tae Xi'an, meanin "Wastren Peace", which haes remained its name tae the present day. This page wis last eeditit on 1 Dizember 2013, at 05:58.